Rafael Paschoalin is aiming this year to become the first ever rider from Brazil to compete at the Isle of Man TT. Rafael who made his road racing debut at the North west 200 in 2012 has been aiming to compete at the TT for some time now. Alongside his North west 200 debut last year Rafael also made his debut at the Macau grand prix finishing in a creditable 24th place on BMW SR1000 superstock bike. 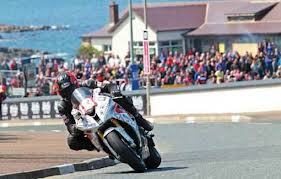 For this year’s Isle of Man TT Rafael is aiming to compete in the superbike, superstock and senior TT races. Rafael Paschoalin pictured here at the North west 200 in 2012 where Rafael took a 26th place finish in the second superstock race. Not only has Rafael achieved top results on road race circuits, Rafael has also achieved many a top result on short circuits including winning the Moto Esporte Brazil cup in 2004. With a such a racing pedigree Rafael Paschoalin’s potential entry into the Isle of Man TT this year is one that will be watched by many not only at the TT but worldwide as well and in particular in Brazil.